As the capital of Finland, Helsinki offers countless ways to spend your holiday: it is, for instance, a centre of artistic culture in Scandinavia, with a number of museums and galleries to visit. It also affords various settings for visitors to enjoy; from a remarkable cityscape to natural parks and preserves. However, despite its large size, Helsinki is an intimate city - and while it is carries a lively atmosphere, it's not particularly bustling. This makes the city particularly easy to walk around and so enjoy its various attractions, cafés and marketplaces at leisure. It's also an ideal holiday destination for individuals, couples and families. Boasting such attractions as the Linnanmäki amusement park, the Merimaailma Sea Life aquarium and the Korkeasaari Helsinki Zoo, children - as well as adults - can take delight in Helsinki's countless splendours. Located along the Gulf of Finland, Helsinki boasts many kilometres of coastline stunning - a geographic feature which makes it ideal to visit during the summer months. The nearby islands, which visitors can access by ferry, are especially popular with locals and tourists. Among Helsinki's most frequented coastal attractions are Nietaniemi Beach in the district of Töölö, the Seurasaari Island with its parks and open air museum and the Suomenlinna naval fortress, which is a UNESCO World Heritage site. The architecture in Helsinki is also one of its highest appeals; the city is strewn with neo-medieval castles and buildings, as well as neo-classic structures which were often used as backdrops for Hollywood movies set in the Cold War era. However, the city is best known for its beautiful Art Nouveau buildings, which date from the early 1900s. Helsinki is also home to a number of architecturally unique churches, most of which are Lutheran, Roman Catholic and Orthodox. As Finland's 'culture capital,' Helsinki can also boast a vast range of art galleries and museums. The largest historical museum in Helsinki is the National Museum of Finland, which holds a large collection dating from prehistoric times to the 21st century. 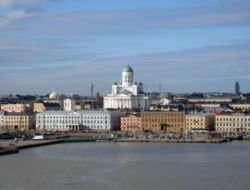 Other major historical museums in the city include the Helsinki City Museum, the University Museum and the Natural History Museum. The Finnish National Gallery is another large art venue and houses the Ateneum Art Museum for classical Finnish art, the Sinebrychoff Art Museum for classical European art and the Kiasma Art Museum for modern Art - which is also said to be Helsinki's most architecturally controversial building. Theatregoers visiting Helsinki are sure to be impressed by the city's grandiose theatres: the Finnish National Theatre, the Helsinki City Theatre and the Finland Swedish Svenska Teatern all host spectacular small to large-scale productions throughout the year. The city also boasts a range of fantastic music venues, including the Finnish National Opera and the Finlandia concert hall. You'll find a number of hotels in Helsinki located near the city's top attractions, making it easy for you to experience all the surrounding splendours of the city. So next time you're considering a city break, why not head to the spectacular city of Helsinki? With its amazing culture, stunning scenery and unparalleled excitement, you're guaranteed a remarkable time. About the Author - Martin McAllister is a freelance online journalist. He lives in Scotland.